New York City-Last Wednesday, March 14th, the three fifth grade classes had an amazing field trip to New York City to see the decade-long running play Wicked on Broadway . Leaving at 10:00 in the morning, they arrived at around 11:30 at Toni DiNapoli, a famous family-style Italian restaurant which was established in 1959. After a delicious lunch the group walked to the Gershwin Theatre. Those who didn’t completely know what the show was about were excited. The play was amazing, as Broadway plays tend to be. This is Glinda’s story about the story of Elphaba’s (the Wicked Witch) life. Glinda is telling the residents of Emerald City about how she became wicked. According to the story, Elphaba was ostracized by her father, who loved his daughter Nessarose. Nessarose tolerated Elphaba, but only because she was confined to a wheelchair and her sister was somewhat her slave. Also, Elphaba is green, so nobody goes near her. 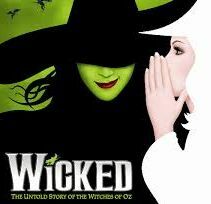 This fabulous story explains Elphaba’s background and how she became wicked, or did she?”So much happened before Dorothy dropped in,” was what the cups at theater said. The story is accompanied by incredible scenery, background music and a witty screenplay. The Recycle Raceway Is Rolling In!